Models of landscape change are important tools for understanding the forces that shape landscapes. One motivation for modeling is to examine the implications of extrapolating short-term landscape dynamics over the longer term. This extrapolation of the status quo can serve as a frame of reference against which to assess alternative management scenarios or test hypotheses. 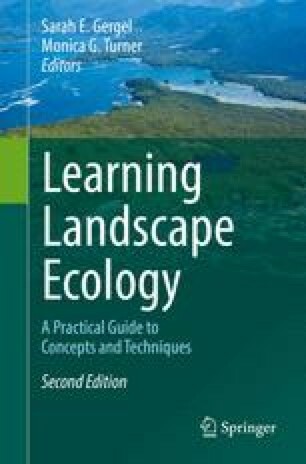 There is a spectrum of ways to consider landscape change, ranging from simple and readily interpretable, to more realistic and less tractable. The goals of this lab are to. The classified imagery used in this lab was developed under funding provided by the USDA Forest Service New Perspectives Program, the National Sciences Foundation through the H.J. Andrews Long-Term Ecological Research (LTER) site (Grant 90-11663) and the Terrestrial Ecology Program of the National Aeronautics and Space Administration (NAGW-3745).